We offer complete repair and restoration services. 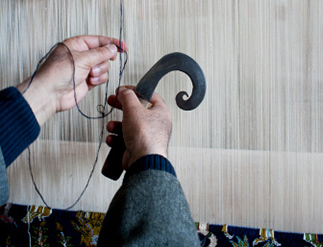 Rugs should be restored by a professional and expert weaver. When you are considering having a rug repaired, you might evaluate the cost of the repair as compared to its value and your personal attachment to the rug. The most common repairs are re-fringing, over-rounding, and re- weaving. Re-weaving turns out to be the costliest repair for the rugs. If your Oriental rug is worn or has been damaged, you will need an expert weaver who is experienced in all the different types of knots, and who has an ample supply of wool colors. In a few instances, we suggest re-fringing. While re-fringing, the weaver uses the salvage, or a minimal part of the rug, rather than adding a fringe to the rug. A stitch, or blind-stitch, should be used to hold the rug in place. If several lines of the rug are removed to make the fringe, the weaver might consider using the cashmere stitch, in which a line or two of wool matches the design around the rug, which enhances the look of the repair. If the corners of the rug are damaged due to wear, we suggest having the weaver secure them or re-weave them. When the entire side of the rug needs repair, the weaver either over-rounds the rug by hand or sews a cord with a matching color on the sides. We suggest repairing the rug in the fashion it was originally made. Make sure that the weaver is able to match the wool color. The colors used in Persian rugs should be easy to match, but the colors in an old Chinese carpet may prove to be more difficult to match.